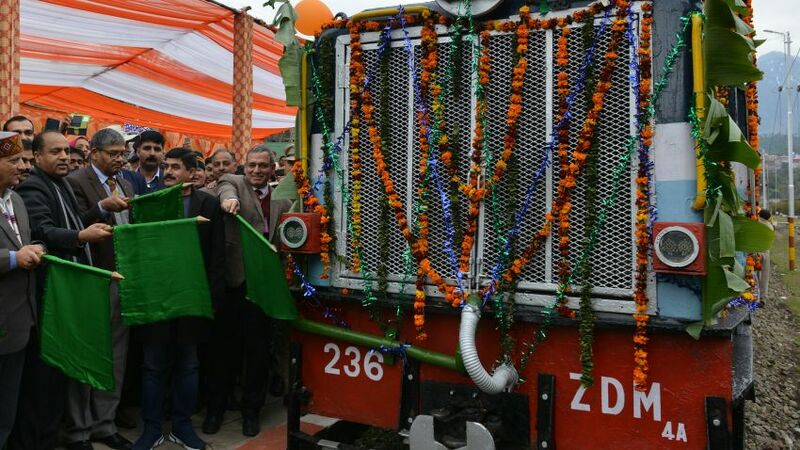 Baijnath: Chief Minister Jai Ram Thakur today flagged off new express train No. 52476 between Baijnath Paprola to Pathankot from railway station Baijnath-Paporla in Kangra district. The Chief Minister, while addressing the gathering, said that this express service will not only help faster transportation to the local public but also encourage tourists to visit this region. He said that now the express train will cover the distance between Baijnath Paprola and Pathankot in 5 hours 5 minutes which otherwise took nearly 7.15 hours to cover this distance. He said that this would make the travelling by train more attractive and timesaving. Divisional Railways Manager Vivek Kumar said the express train would give a new boost to the tourism development in the region. He said that all the trains plying on this section has been refurbished so that the tourist could enjoy the scenic beauty of the area. He said that Heritage gallery has been constructed at Palampur Station. He said that Steam Heritage Train was also plying between Palampur and Baijnath for attraction of the tourists.